Cash seized from criminals is being used to help combat anti-social behaviour at a beauty spot in Colwyn Bay. Local people were being put off going to parts of the 50-acre Eirias Park because they were being blighted by petty crime and drug dealing. Now two environmental projects have secured a £2,500 grant from North Wales Police and Crime Commissioner Arfon Jones. The money has come from the Your Community, Your Choice fund administered by Mr Jones, the Police and Community Trust (PACT) and North Wales Police. Half the money was recovered through the Proceeds of Crime Act, by confiscating the ill-gotten gains of offenders, with the rest coming from the Police and Crime Commissioner. In this case the money has been given to the Colwyn Bay Conservation Environment Federation for the Eirias Park Footpath Project and the Grow Wild Project. Mr Jones said: “I get particular satisfaction that part of the funding comes from the proceeds of crime, so that money is taken out of the pockets of criminals and their ill-gotten gains by the courts and is put back into community initiatives. PC Kelly Evans, the safer neighbourhood team officer for Colwyn Bay, said: “Last year the Dingle area of Eirias Park suffered quite a lot of anti-social behaviour so we worked hard to try to reduce the effect it was having on the local community and the local residents. “My team did a lot of hard work to try to resolve the issues which we finally have. We worked with Conwy County Council to obtain a Public Space Protection Order and we were successful. “When we heard about this application we thought it would neatly match with the Dingle project because we thought it would give them an opportunity to have some sort of reward. “I worked with them in the application process. It’s a win-win for them because we’ve reduced the anti-social behaviour, and we’ve also given something back to them and their community. Bill Macmillan, the treasurer of the Colwyn Bay Conservation and Environment Federation, was delighted they had secured the funding. He said: “The intention is to reinvigorate an underutilised area of Eirias Park together with completing an all-weather paved circuit around the park. 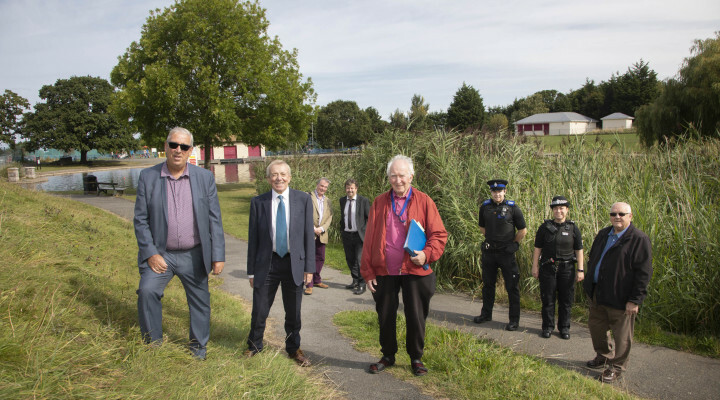 “The northern fringe of Eirias Park has been used for footpaths previously but over the last decade or so it has fallen into disrepair and consequently is hardly used by the public now but is an attractive area for petty crime and drug dealing and use. “We are hoping that by increasing the traffic through this area then it will cease to be attractive for the criminal activity. PACT David Williams joined the Police and Crime Commissioner on a visit to see how the money was being spent. He said: “I think it’s tremendous that we see Your Community Your Choice monies being put into a place of peace but a place for children, place for youth, a place for adults with a variety of facilities and all manner of things that they can do here. It gives PACT a great deal of pleasure to be party to this sort of project. “It’s very appropriate that an area once blighted by anti-social behaviour is being transformed using money that’s seized from criminal people. This entry was posted in Community, Environment, Featured, News. Bookmark the permalink.